I wear a full face helmet for the protection, noise reduction, and the look. Yes, I think full face helmets are better looking than skullcaps. You'll certainly stay better-looking if you happen to find your face heading for the pavement. 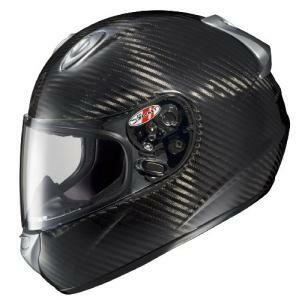 Should you want to get yourself a fine full face helmet, you could certainly do worse than the Joe Rocket RKT101 Carbon helmet. The RKT101 meets or exceeds DOT and Snell standards. The carbon fiber composite shell comes in three sizes, so you can get the perfect fit without having an excess of padding. Speaking of padding, the liner of the RKT101 is multiple density, impact-absorbing EPS with heat and humidity dissipating SilverCool technology. The liner and cheek pads are removable and washable, because no amount of tech is going to keep that thing clean forever. Joe Rocket is certain that the shape of this wind-tunnel-tested helmet will provide a comfortable ride without your neck taking the brunt of the wind. External and internal ports with a removable breath deflector allow a consistent flow of cool, fresh air while scooping your hot breath away from your shield. A two-stage shield closure system creates a secure seal with the eye port gasket. This helmet features a Rapid Fire HJ-09 shield replacement system. That just means you can replace the shield quickly and without tools. As all shields ought to be, the RKT101's shield is optically correct, anti-scratch, and offers the rider 95 percent U.V. protection. The size selection ranges from XS to XXL. Joe Rocket has come a long way in the past few years, and this is one heck of a practical helmet. The RKT101 is worth the price.